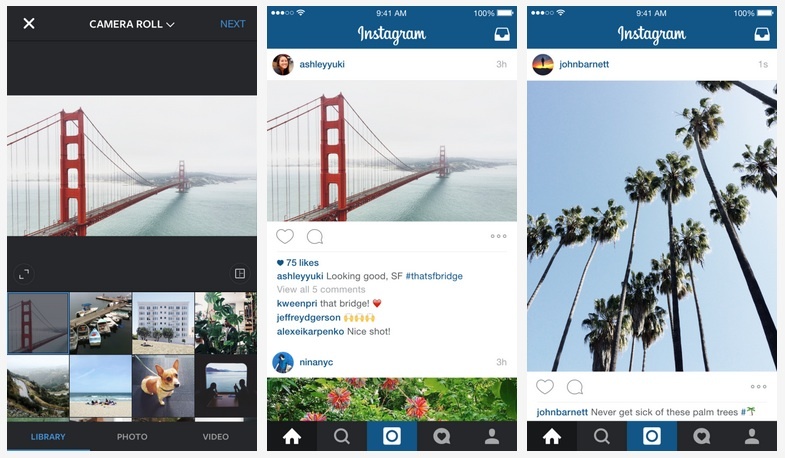 You’ve heard by now that Instagram is rolling out some changes. But what exactly are those changes? And what do they mean for you? If you’re the average Instagram user, chances are you haven’t noticed much change at all. Aside of course from the new flat logo and monochromatic interface. And if you are this average user, you don’t really have that much to fear by way of change. The users who are on the edge of their seats in light of this news are corporate account and brand managers. The new algorithm could have a huge effect on their ability to reach followers. In line with policy for other networks owned by Facebook, the actual algorithm itself has not been divulged. We do however have a pretty good idea of what it’s going to look like. Even if you only rarely use Instagram, and the algorithm change is news to you, you are probably at least aware of the changes to their visuals. The change in graphics tows behind it some massive changes in the math behind the user experience. These changes are likely going to make the user experience more like that of facebook, with the elimination of the chronological feed. Some like this change, some don’t. For many, it seems as though Instagram is selling out it’s core user base in order to get more ad revenue. There is less accountability and transparency in a non-chronological feed. While many do complain, there are a lot of people that are very optimistic about the changes. For the average user this could very well be a positive change in experience. According to instagram the average user only sees 30% of posts. This change is intended to make sure that the 30% that you see is what is most relevant to the user. This is done by looking at what posts you interact with the most. They are not going to be dragging in any metric or anything from facebook or anywhere else outside of Instagram. The people who are really worried about this are corporate accounts. Instagram used to basically guarantee facetime with followers. Now, not so much. That being said, this new algorithm as far as we can tell is based almost entirely on how people interact with the accounts they follow. If people interact with an account regularly, the account is likely this going to benefit from this change. If your content doesn’t resonate with your followers, you could be in real trouble. That being said, if you’re having trouble engaging with your followers, you’re already doing something wrong. For many this could be a blessing in disguise, if you are worried because you are not connecting with your followers. Use this as an opportunity to take a step back, do some research, and take a fresh approach to how you reach out to your followers on instagram. If you happen to fall into this last category, you’re probably asking; well, what do I do now? Here are some must-do instagram best practices for brands that help help boost your engagement with your audience, and set-up up to benefit from the new algorithm. If they’re following you, it’s because they like what you’re doing. Focus on presenting them with your products and brand identity creatively and in it’s best light. As a rule of thumb, you want to showcasing the experience not the product. Don’t make a video just for the sake of making a video, but if you have a product that you think would look good in video form, DO IT! This is a great way to engage your followers and keep your brand moving with the times. Videos are an excellent tool for increasing ecommerce conversion rates. Don’t forget that portrait layout is an option for your photos, taking more screen space is a definite plus! Take the time to put together attractive high quality posts. 1 great image is better than five mediocre ones. You should know what your audience like better than anyone else. Look up other similar accounts and competitors that perform well, and learn from them what helps boost interaction with followers. Find out what works and what doesn’t. Tailor your image and begin to develop your own aesthetic and cohesive identity, a couple months of high quality content later and you’re looking at an engaged follower base.